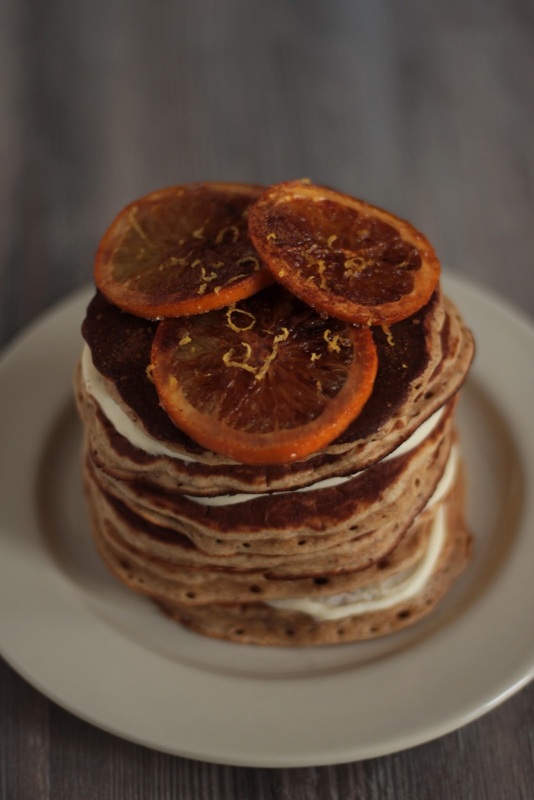 Looking for a yummy winter pancake recipe with oranges, white chocolate cream and cinnamon? 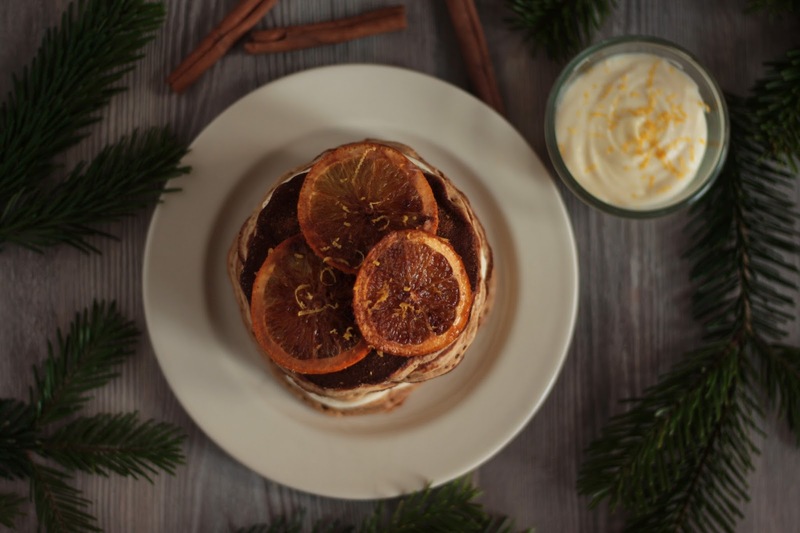 Are you in the mood for a tower of special Christmas pancakes, or maybe you want to make a holiday themed breakfast for your loved ones? We think you should try this cinnamon and orange dish. It looks fancy but is super easy to make. We will explain how to make a white chocolate yoghurt cream, how to caramelize oranges real quick and how to make fluffy winter pancakes. Melt the chocolate in a microwave (or in a water bath). Put the yoghurt in a bowl and stir it. Start slowly pouring the melted chocolate into the yoghurt and keep stirring. The mixture will start getting more solid. 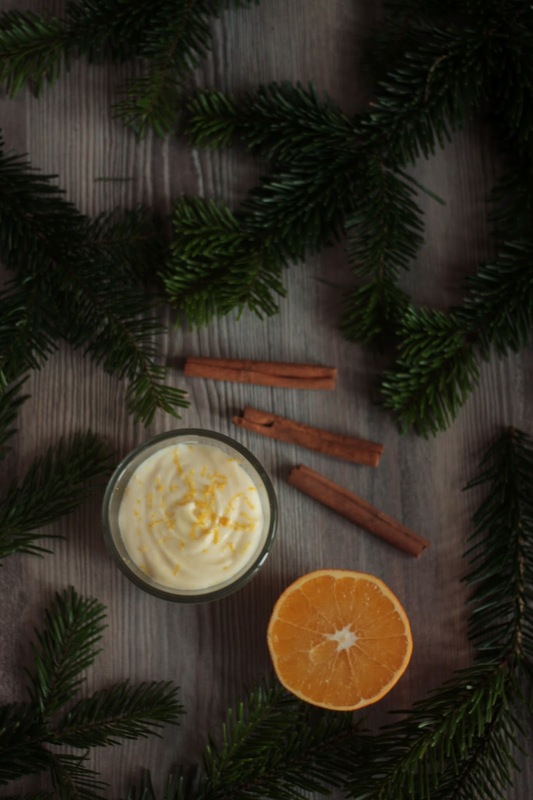 Sprinkle some orange or lemon zest into the cream for a Christmas taste. You can buy it or make the zest yourself. 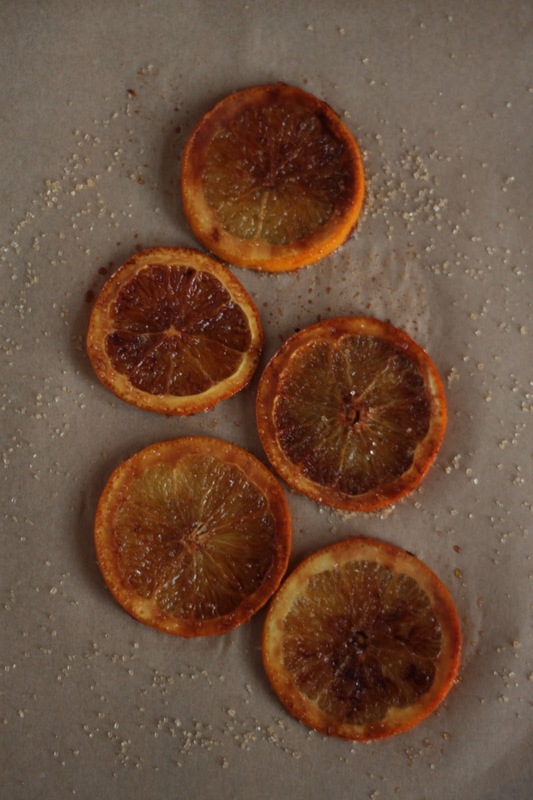 Let's caramelize a few slices of oranges. Just slice discs of an orange (we only used the big ones from the middle of the fruit) and fry them in a pan with some sunflower oil (about one tablespoon) until they get a little brown (like on the picture). Now pour a little bit of brown sugar over the slices, flip them and sprinkle some on the other side too. The sugar will melt and give the oranges a sweet and nice flavor. You should use a fork to safely get the orange slices out of the pan since they are very hot now and we don't want to hurt anyone. Let them cool down while you make the pancakes and place the prettiest three on top of the stack at the end. If you're a regular guest on Pancake Stories, you might have noticed that we mix the ingredients in 3 separate steps instead of mixing everything at once. You will need 3 different bowls, one of them needs to be big enough to accommodate all ingredients at the end. This is very important for maintaining a good fluffy result. Don't be worry, it is worth it! Start off with separating the eggs. Combine the egg white with the buttermilk and orange juice with (the fruit meat) and whisk until the egg gets a little foamy. If you don't use home pressed juice, that's ok. The orange juice will give the pancakes a great winter-ish taste. Melt the butter and let it cool down, then put it in a big bowl with the egg yolk, 15g brown sugar and 4g cinnamon. Stir well. Make sure that you use a big bowl for the egg yolk as this will be the bowl everything goes in at the end. Now put flour, 15g of brown sugar, salt, baking powder and baking soda in a third bowl. Mix the ingredients, set the bowl aside. Pour the egg-white-buttermilk-orange mixture into the big bowl with the egg yolk and stir. Now slowly pour the dry ingredients from the third bowl into the big bowl with liquid ingredients and stir carefully. Let the batter rest for 10 minutes in a chilly place (fridge or cold balcony for example). Meanwhile heat the stove. Use a well coated pan, you will not need any oil, there is already butter in the mix. Put the desired amount of batter in the pan. Wait with the flipping until you start to see tiny bubbles appear and the edge of the pancake darkens a little. 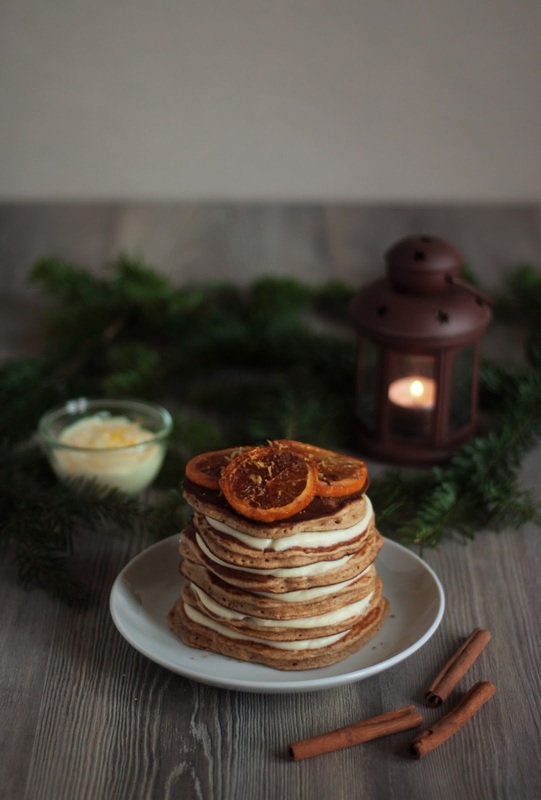 Serve the pancakes like on the picture: pancake, a layer of cream you previously made, a pancake, cream and so on. 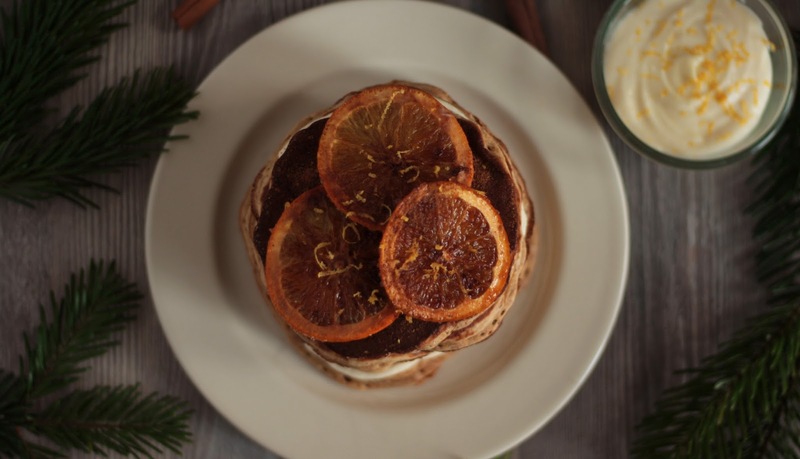 Don't put cream on the last pancake - arrange caramelized oranges instead and sprinkle some zest if you feel like doing it. Eat it and let us know how it turned out by tagging your pictures #pancakestories on social media.